My husband John with his daughter, mother and grandson. 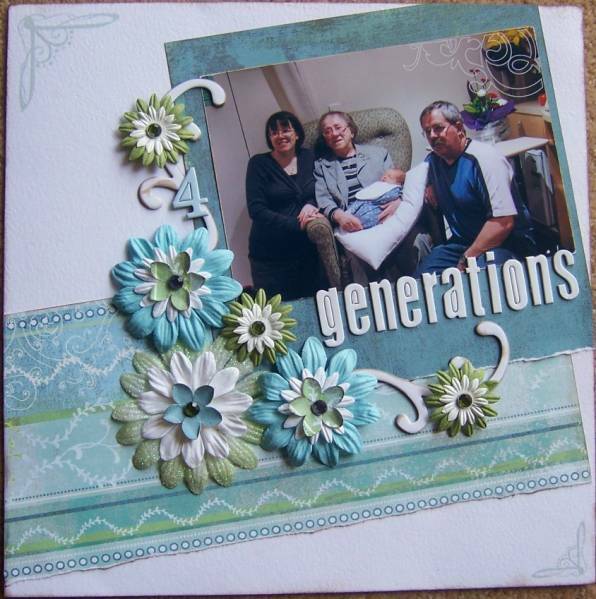 This is just gorgeous - I love the paper, and the flowers are the perfect touch!! This looks great Karen.. I love your cluster of flowers! The flower clusters look sensational! Well done. Gorgeous LO - love those flowers! What a precious photo and I love that pp. Beautiful. Fantastic Karen, love it all. Lovely paper and flowers. Very pretty page. Very nice page, the rubons look great. Your flowers look so lovely. Fab!! The PP is lovely with the flowers and the photo. Great LO. BG pp is perfect for your LO and the flowers are gorgeous.